Researchers around the world have been exploring a growing problem in the deaf community: how to facilitate communication between the 360 million people with hearing impairments and the orally-spoken world. Sign language is commonly taught to the deaf, however, rarely taught to the hearing members of the community. As a result, a communication gap exists. Signers must rely on a human interpreter or pen and paper to get their words across to friends, colleagues, or employers. The language barrier between the hearing and hearing impaired creates challenges from lost job opportunities to discomfort in friend groups and must be overcome by a person who relies on signing to communicate in the average social atmosphere. Communication between the hearing and hearing impaired is a huge problem: we cannot allow millions of people to rely on interpreters or pen and paper to have a voice. 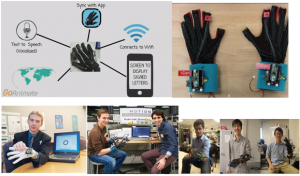 That’s why college students like Hadeel Ayoub, Thomas Pryor and Navid Azodi, and Ranjay Krishna, Seonwoo Lee, and Si Ping Wang have been working on gloves that can translate hand gestures into audible speech. Sensors in the gloves measure the change in position of a person’s fingers and hands. The signals are then processed by computer chips and translated into speech. Many different prototypes are being explored—some that connect to apps on your smartphone, others that display what the gloves translate via little screens attached to the wrists of the gloves, and others that communicate via laptop. However, all use the same principle of a wearable device that can replace reliance on human translators for the signing community, and one day could be more convenient than pulling out pen and paper to communicate everyday needs like your morning Starbucks coffee order. As exciting as these gloves are, they are still in their early stages of development. Right now, they can only translate a few simple, distinct gestures, and will not be ready for commercial development for a few years. However, innovations such as these sign language translating gloves are just another example of how technology can break down disability barriers and give equal opportunity for all to communicate and thrive! This entry was posted in Tech Blog and tagged Assistive Technology, Hearing Disabled Assistance, innovation, Research, Signing Gloves.